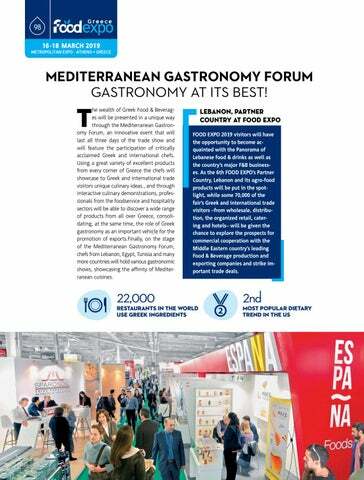 MEDITERRANEAN GASTRONOMY FORUM GASTRONOMY AT ITS BEST! he wealth of Greek Food & Beverages will be presented in a unique way through the Mediterranean Gastronomy Forum, an innovative event that will last all three days of the trade show and will feature the participation of critically acclaimed Greek and international chefs. Using a great variety of excellent products from every corner of Greece the chefs will showcase to Greek and international trade visitors unique culinary ideas., and through interactive culinary demonstrations, professionals from the foodservice and hospitality sectors will be able to discover a wide range of products from all over Greece, consolidating, at the same time, the role of Greek gastronomy as an important vehicle for the promotion of exports.Finally, on the stage of the Mediterranean Gastronomy Forum, chefs from Lebanon, Egypt, Tunisia and many more countries will hold various gastronomic shows, showcasing the affinity of Mediterranean cuisines. LEBANON, PARTNER COUNTRY AT FOOD EXPO FOOD EXPO 2019 visitors will have the opportunity to become acquainted with the Panorama of Lebanese food & drinks as well as the country’s major F&B businesses. 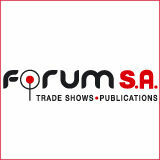 As the 6th FOOD EXPO’s Partner Country, Lebanon and its agro-food products will be put in the spotlight, while some 70,000 of the fair’s Greek and international trade visitors –from wholesale, distribution, the organized retail, catering and hotels– will be given the chance to explore the prospects for commercial cooperation with the Middle Eastern country’s leading Food & Beverage production and exporting companies and strike important trade deals.